Schoolchildren will be among those taking part in two acts of remembrance in Farnham to commemorate those who have fought, died and lived through armed conflict. The first service is on 9 November and is organised by Farnham Town Council and the Farnham Schools’ Confederation, which is a partnership of local schools. The Mayor of Farnham Councillor David Attfield says: “On 11 November 1918 at 11am World War One officially ended. While we mark the occasion every year, this year is all the more poignant as we commemorate the centenary. 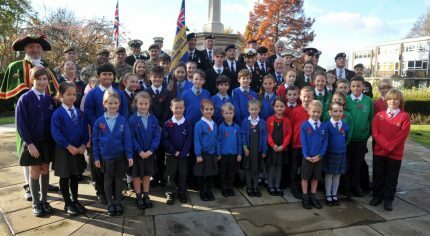 The schools’ remembrance service takes place at the war memorial in Gostrey Meadow on Friday 9 November from 10.45am. The children will be joined by representatives from the Royal British Legion, the Princess of Wales’ Royal Regiment and Deputy Lieutenant of Surrey Brigadier Roger Hood QVRM TD DL. Brigadier Hood is a recipient of the Queen’s Volunteer Reserves Medal. Members of the public are welcome to attend. On Sunday 11 November there will be a joint Remembrance Sunday parade in which the mayors of Farnham and Waverley will take part alongside representatives of the armed forces, local dignitaries, uniformed services and local scout and guide groups. The parade will start in Castle Street at the site of the world’s first two-minute silence which was held in May 1916. The parade will reach Gostrey Meadow for a short service at 10.45am and is open to all. At 11am all those attending will fall silent for two minutes before guests make their way to St Andrew’s Church for the remembrance service. The Remembrance Sunday parade is organised by Farnham Town Council in conjunction with the Farnham branch of the Royal British Legion. Drivers are advised that temporary road closures will be in place from 10.15am to 11.30am. The roads affected include Castle Street, The Borough, Union Road, South Street, Downing Street, Longbridge and Victoria Road. Remembrance services will also take place at the war memorials in Badshot Lea, Rowledge, Hale and Weybourne and at St Thomas on the Bourne and St Peter’s at Wrecclesham. Local councillors will lay wreaths on behalf of the town.